Kingdom Zoo is a lifestyle and although I didn’t have a name for it back then, it always has been. 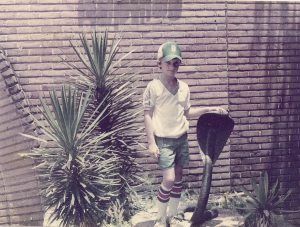 This is a shot of me outside the serpentarium at The Houston Zoo when I was eight years old. I always loved the cobra statue and was absolutely in awe of the creatures inside the facility. When you see me with animals on God’s Outdoors with Chester Moore on GETV or on this blog, know this was something God put in me long ago. Thank you so much for supporting our ministry work and wildlife outreach. It means the world to me.